Hi, Neighbors (and future neighbors!). 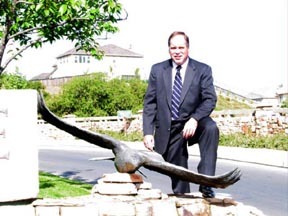 I am Gary Frimann, a resident of Eagle Ridge and a Real Estate Broker. I started Eagle Ridge Realty in December 2001 to address the needs of those who are selling or looking to buy a home in the Eagle Ridge development. I consider this area pretty special; therefore, I have started a real estate agency just to offer my services for potential sellers and buyers of this wonderful area that I call home. I believe it is worthy of my efforts to track listings and sales in this community, of which I have collected a database on all listings and sales that have occurred. I feel that this will be an enormous help to my clients to make an informed decision, whether they plan to buy or sell in Eagle Ridge. Eagle Ridge Realty is a registered HUD and V.A. Agency. If you are interested in buying investment properties which have been foreclosed by either of these government agencies, we can help. Give us a call. We can write up the offer for you! When you hire a Realtor, expect knowledge and skill in the areas of financing, contracts, negotiations, and marketing. Trust the buying and selling of your home to professionals. Accept nothing less than excellence. Give us a call, and let's meet to discuss your real estate needs. Thank you. Gary Frimann is a Realtor, with membership in the National Association of Realtors, the California Association of Realtors, and the Santa Clara County Board of Realtors. Gary is also an instructor at Gavilan College in Gilroy, California. Eagle Ridge Realty is a member of the Gilroy Chamber of Commerce. He also writes a column on real estate for the Pinnacle, the local South County newspaper. Gary Frimann is a licensed Real Estate Broker, as well as HUD approved Broker. Contact Gary if you are looking to buy a home, whether it's for full-time living or weekend golfing getaways. Gary started his real estate career in 1986 as a loan officer for Security Pacific Bank, and later worked for a mortgage bank as a mortgage broker. He handled many different types of properties, and his work included government-insured loans, SBA loans, and loans for primary residences, second homes, office condominiums, and bare land. He later became a real estate agent for Realty World/Action Realty in Morgan Hill, California. Eagle Ridge Realty specializes in properties in Eagle Ridge and the surrounding communities of Gilroy, San Martin, Morgan Hill, and the rest of the South Santa Clara Valley. Whether you're looking to buy a home or sell one in the Eagle Ridge community or in any South County environs, Eagle Ridge Realty will help you achieve your goals. In addition, if you want to buy or sell a home outside of this area, Eagle Ridge Realty can help youanywhere from South San Francisco or Pleasanton to Salinas, Watsonville, and Hollister.